Looking for a way to share strategic and powerful new video clips with those who need to find Jesus? Easy. It offers Christians a categorised range of third-party evangelistic video clips. It’s a one-stop source of approved conversation-starting video clips that Christians can easily share on Facebook (or other social media), embed in a blog, or download to a smartphone to share one-to-one. Got an additional comment? You can even log on to share in total confidence, anonymously. 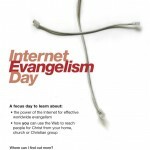 Internet Evangelism Day is set for the last Sunday of April. This international web awareness day, for churches, missions, colleges or any Christian group, aims to demonstrate the potential of the Web for effective evangelism. Check the testimonies of people who found God online. Read the stories of a wide range of web evangelists – and note how many of them have no technical knowledge at all. Learn how you could create a short focus time in your church, mission group or college, using the free downloads from IE Day’s site – video clips, Powerpoint, drama scripts, music and handouts. The 10th annual Afghan Christian Calendar is available now. This year’s theme is “The Majesty of God (Azamat-e-Khoda).” All the beautiful calendar pictures and Bible verses proclaim the majesty and greatness of God. This is an eternal message of life and hope for a people who have experienced decades of war-torn tragedy. The calendar is an encouraging and low-threshold evangelism resource appreciated by Afghans. The Afghan New Year begins on the first day of spring, March 21. You can order this calendar for your Afghan friends and acquaintances. Discounts for orders of 10 or more. CAN YOU VAULT US INTO 2008 BY PROVIDING A LIFT? THE BACKPAGE: WHAT KIND OF HOPE COMES FROM STRIPPING AWAY HOPE? The channel currently features 17 videos, with many more to be added in the weeks and months ahead. Available for viewing are worship clips from Azerbaijan, Congo, India (Assam, Bengal, Punjab), Himalayas, Malawi, Mongolia, South Africa and Sudan. You are welcome to subscribe to the channel, after which you will be notified as new videos are added. (at)gmail.com [As a means of preventing spam for our contributors, in the preceding email address(es), we have broken them up with a carriage return and replaced the “@” sign with “at”.] Please forgive us for any inconvenience. They’re a Richmond Personal Injury Law Firm. If you have *any* reason to have to call a lawyer and you haven’t engaged one yet, I would *sincerely* hope *someone* gives them a call, if for no other reason than they know that Brigada readers appreciate them helping underwrite Brigada. Expect to hear more about them in the future — and for now, we *greatly* appreciate their help! Granted — that’s a lot of volunteers. So the question is.. Has God prepared you with the resources to help with any of these gifts to take us to the finish line? You can pull the money from your PayPal account or from any major credit card. Or if you prefer, send a check payable to Team Expansion to: Team Expansion (Brigada secretary), 13711 Willow Reed Dr., Louisville, KY 40299. (Team Expansion is a 501(c)3 incorporation so for USA citizens, your checks made out to Team Expansion are tax-deductible.) As always, be sure to let us know if you’d like us to promote any particular service or ministry, or if you’d prefer your gift be anonymous. And thank you in advance for helping. THE BACKPAGE: WHAT KIND OF HOPE COMES FROM STRIPPING AWAY HOPE? — Today’s Wall Street Journal Europe Edition caught my eye (Dec. 7 issue). The center pages were all about how Europeans, though economically ok, were seemingly more and more afraid… and worse, without hope. The pages were based on a survey of 10,373 Europeans from throughout Western Europe. Control populations were included in the USA, India, Russia and Turkey. In all, they gathered responses from 20,999 people in 20 countries — no small group. The outcome? Europeans are scared. Lack of direction, lack of leadership, lessening freedoms, more worries, more selfishness, and increasing pessimism. Interestingly, the responses also revealed a shocking rise in secularism, a loss of purpose, and, in general, a breakdown of society. The study included, among many other references, a quote from Yoda, of all folks (Star Wars; 1999). :-) “Fear is the path to the Dark Side. Fear leads to anger, anger leads to hate, hate leads to suffering.” Sure enough, many Europeans reported fears about terrorism, war, global warming, moral decay, and finances. In fact, as many as 1 out of 10 reported that things were so bad, they simply had no hope — period. Even greater numbers said they had lost hope in the future. In the same issue, a reviewer chronicled the new movie, “Golden Compass.” He observed that it was “stripped of ideas,” made little sense, yet was based on anti-religious elements. Apparently, the author is an outspoken atheist making no secret about his efforts to chip away at faith. The reviewer, Joe Morgenstern, wrote, “The script… retains an all-seeing and all-knowing institution that kidnaps children and ships them off to an arctic facility where their souls are permanently separated from their bodies.” In the book form of “Golden Compass,” that institution is clearly identified as “The Church.” Because of public outcry, the movie refers to it as, simply, “The Magisterium,” but the metaphor, nevertheless, clearly remains. So I had to grin. I shuttled back between the review of Golden Compass and the outcome of the survey. Duh. Should we be surprised? Clear case of ‘garbage-in, garbage-out.’ If we program our children with movies like “Compass,” we shouldn’t be surprised by the survey results. Morgenstern continued, “Vagueness colors all, banishing emotional connections in the process.” News item: I have seen a better way. So this Christmas, may you experience a renewed sense of hopefulness. May the fire & passion reawaken within you. And, if you go see “Golden Compass,” may it not drag you down. Apparently, it and several other factors have been dragging us down now for several years.